A question that I just asked myself and became quite emotional over. I suddenly realised that I’m afraid of failing but also afraid of succeeding. Why? Because failing means that I’ll never make it, but I’m also scared that I won’t have what it takes to succeed which will mean that I’ll keep failing at every attempt. This fear often puts me off attempting to succeed because I can’t stand the thought of failing. I remain where I am, out of alignment, far removed from my true purpose and on a road to nowhere. So how do I overcome my fear? I’m a singer, or at least that’s what other people tell me I am. But I’ve never really found my true voice – or in other words, never really found true confidence in my voice. I enjoy singing, I know that my voice is ok as other people tell me that it is. But every time I sing I’m afraid because it might not sound that good. I realised a long time ago that singing actually helped people to accept me as a person. But I wasn’t accepting myself. Even down to my name, I hated telling people what my name was. 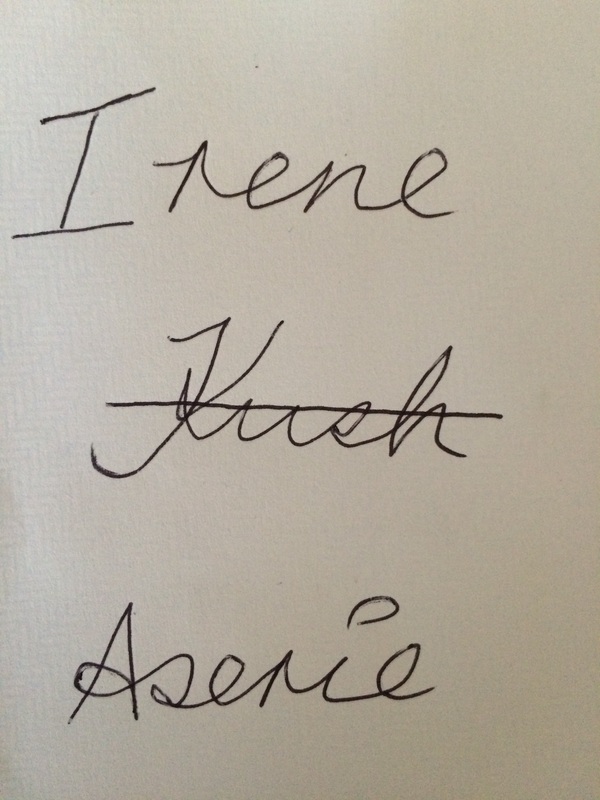 I felt that my name ‘Irene Kush’ was just weird and old fashioned and down right embarrassing. I got teased a lot when I was at school because of my names. Eventually I began to hate my name and then who I was. I lost my sense of identity. When I got married and my surname changed to Aserie, I became a little more comfortable giving my name to people but still not truly happy because I hated my first name. I could easily just change my name, but I didn’t think I was good enough to fit any other name either. So I became stuck with the name that I was given. I’ve been ‘doing it afraid’ ever since I was a child. Just telling people my name was an internal battle that I had to overcome. Before I even started a conversation with someone new, I was afraid because I had to get past telling them my name first. I tried to avoid conversations with people and so became a bit of a recluse. I spent a lot of time on my own, talked to myself, read lots of books, wrote my own fictitious stories and eventually my own fictitious songs. I guess that’s one of the reasons why I drink alcohol. It’s amazing how much false confidence a glass of wine or three can give you. Writing became my way of communicating with people, I could only really open up about issues through my written word as oppose to my spoken word. But I wanted to write from a more honest and purposeful place. However, I became afraid of revealing the real me through song because I was afraid of being rejected. Singing was a way of getting people to like me but what if they didn’t like my music or what I had to say? I stopped singing and writing. As a result I became depressed, unhappy and way out of alignment with who I really was. Suddenly I had no way at all of expressing my thoughts and feelings. Now I was internalising everything and too afraid to own my true self worth. I was unable to cultivate my self worth and keep reminding myself of my self affirmation to just ‘do it afraid’. I didn’t want to be on my death bed before I figured it out. I needed to make a change now. I first had to learn to accept my name. I realised that I was much more than my name. I was so much more than I had ever imagined myself to be. I then started writing again. Not for other people but just for me. Not fictitious songs and stories, but I actually started to write out my real story. I knew that I had to write from a place that had the potential to inspire and change lives just like I had managed to do with myself. I finally realised I was on my way to becoming the woman I was meant to be. But had I realised all of this too late? I remember recently when a music producer I had worked with in my teens looked at me during a studio session. He always thought that I had what it takes to be a musical superstar. He looked at me and was shaking his head. He felt that that I should never have stopped the music because by now I would have been a successful artist. I often wrestle with the notion that it’s too little too late. But I know that my time will come for me to be exactly who I was sent here to be. I wasn’t ready then but I’m ready now. It may not be as a musical superstar but whatever plans God has for me, I know I will be the best that I can be. I will be exactly where I need to be. In the meantime, I will continue to work on improving me and stepping out in faith towards my destiny. I am learning everyday not to value what other people say more than what I say. I am learning to do what I want to do instead of what other people want me to do. I am working towards having what I want for me instead of having what other people want for me. I am learning not to let a glass of wine bring out the more confident me. I’m in my mid thirties and I am in the process of finishing an album that sounds exactly the way I want it to sound. I’ve written a book about the journey to discovering my self worth and I’m getting much closer to being in alignment with who God intended me to be. I have God given talents and I’m not afraid to use them. But I also understand that it’s not your gift that guarantees your success it’s how hard you’re willing to work at it. I’ve worked hard to overcome the challenges that I’ve faced. I’m still working hard to master my worth and skills. When I look at myself I don’t see what other people see, I’m learning to see myself through my own eyes and to accept and be comfortable with what is revealed. So am I gonna make it? I truly believe that I will.